Acute myeloid leukemia (AML) is characterized by the proliferation of malignantly transformed cells of the myeloid series in the marrow that arrest in their maturation . They result from clonal transformation of hematopoietic precursors through chromosomal rearrangements and multiple gene mutations [2,3]. Gingival enlargement as a primary manifestation of AMLs is well-documented [4,5]; however to the best of the authors' knowledge, gingival enlargement as a primary manifestation of aleukemic leukemia has not been thus far reported. A 34-year-old male presented with complaints of swollen, bleeding and tender gums since 15 days, which was progressively worsening. The patient was being treated for typhoid and had been referred by the concerned physician with regards to the gingival swelling. He had been prescribed ciprofloxacin and paracetamol for the treatment of the typhoid for a period of 5 days. There was no history of any other systemic diseases, allergies or use of medications in the past. 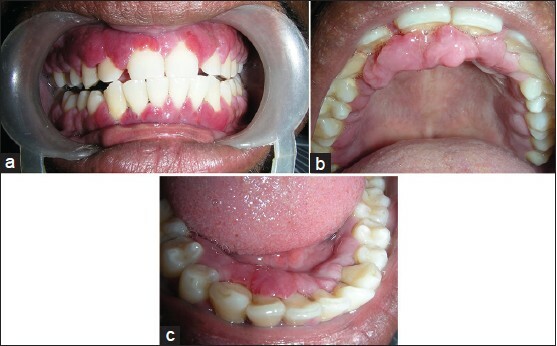 Examination of the oral structures revealed edematous, generalized magenta-red colored gingiva, with nodular surface, and associated with the loss of stippling of the attached gingiva [Figure 1]a]. Gingival enlargement was noted on the buccal and lingual surfaces [Figure 1]b and c] of both arches without significant local deposits of calculus or material alba. Bone loss was not evident on a panoramic radiograph. The patient's blood reports revealed leukopenia with relative lymphocytosis, anemia, and thrombocytopenia. Widal test for typhoid was negative. A fresh blood investigation was insisted upon which revealed leukopenia (white blood cell count 2800/mm 3 ), hemoglobin 10.8 g/dl and a low platelet count (thrombocytopenia) on smear. The patient was then referred to a medical center for a bone marrow evaluation. Bone marrow aspiration showed dyserythropoiesis, decreased lymphoid series and dysmegakaryopoiesis with abnormal blast cell percentage of 98% [Figure 2]. Cytochemistry revealed myeloperoxidase positive cells (97%). 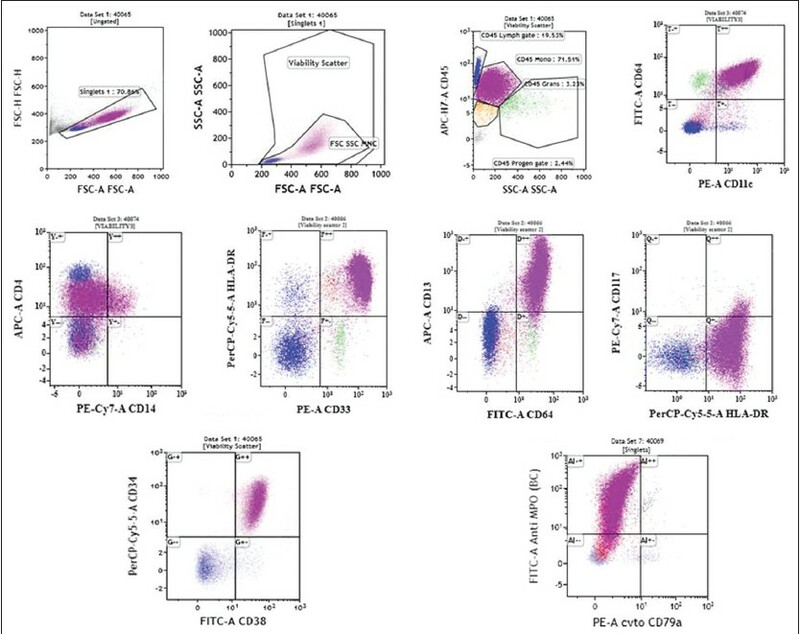 Further immunophenotyping revealed expression of myeloid markers with CD13 (93%), CD33 (98%), HLA-DR, CD34 and CD38 as 97%. The blast also expressed CD64 (98%) which suggested acute monoblastic leukemia (AML-5a) [Figure 3]. As blast cells or abnormal monocytes were not detected in peripheral smear, a diagnosis of aleukemic leukemia was made. Shortly following diagnosis and before chemotherapy could begin, the patient died of pneumonia and septic shock. Gingival hyperplasia is a well-established extramedullary presentation of leukemia. "Aleukemic" or "subleukemic" forms of AMLs are more likely to present as gingival enlargements in adults . In a series of 1076 leukemic patients, Dreizen et. al. found gingival enlargement in 66.7% of M5 patients and 18.5% of M4 patients . Gingival involvement is common in AML, and in these kinds of patients, a dental therapy without hematological consultation could have fatal outcomes. Acute monoblastic leukemia is a subtype of AMLs characterized by >80% cells of monoblastic lineage in the bone marrow. These cases may first present to the dentist, who must be aware of the clinical presentations of this disease [3, 7, 8]. In this case report, the rapidly progressing gingival enlargement prompted the patient to seek therapy. Patient presenting with spontaneous gingival bleeding and severe enlargement of a very short duration raised the suspicions of leukemia. Inflammatory gingival enlargement, scorbutic gingival enlargement and plasma cell gingivitis could be considered as differential diagnosis. As the patient did not show substantial deposits of local factors, no systemic signs of vitamin C deficiency and no history of allergic conditions, the primary attention were focused toward a more life-threatening cause of the gingival enlargement. Ciprofloxacin and paracetamol are not known to cause such changes in the gingiva. The blood reports revealed leukopenia in contrast to the normally expected leukocytotic picture of leukemia. Fresh blood reports also mimicked the previous picture. The diagnosis of a hematological malignancy based solely on gingival hyperplasia, keeping in mind the morbidity and high mortality rate is one that is often shied away from. This is not necessarily due to lack of clinical and theoretical knowledge, but to refrain from alarming the patient in what may well be an inflammatory or other unrelated gingival swelling. Thus in this case, although we suspected leukemia, a provisional diagnosis of nonspecific gingival enlargement was made-and the patient was asked to have a bone marrow examination. 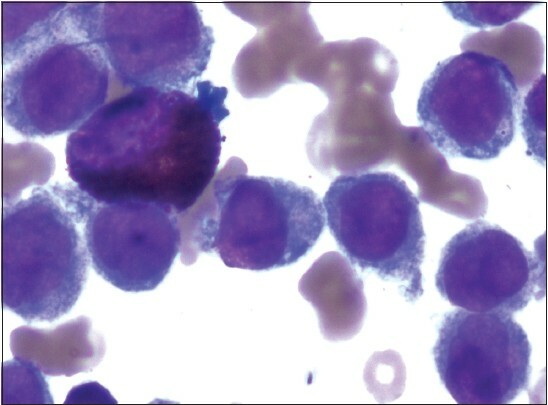 The bone marrow aspirate demonstrated hypercellular bone marrow with >80% monoblastic cells confirming the diagnosis of acute monoblastic leukemia (AML FAB-M5). Ciprofloxacin rarely may cause leucopenia and thrombocytopenia due to bone marrow suppression , but as the bone marrow aspirate contrarily revealed a hyperplastic bone marrow, the possibility of leucopenia due to ciprofloxacin was eliminated. As all other likely causes of gingival enlargement were overruled, leukemic cell infiltration in the gingiva was presumed, and the need for gingival biopsy was dispensed. Leukopenia may be a presenting feature in the early stages of leukemia. In a series of 20 cases diagnosed as aleukemic leukemia, Mettier and Purviance  found that in 13 patients, the highest leukocyte counts did not exceed 9000 cells/mm 3 . Of these four patients developed a terminal leukocytosis ranging from 12,000 to 52,000 cells/mm 3 after a prolonged leukopenia. This shift in the leukocyte levels occurred within 24 h in one patient and within 3 weeks prior to death in the others. They concluded that these cases were characterized by leukopenia except when a transient increase in the number of cells or a terminal leukocytosis occurred. Thus, leukemia is primarily a disease of the hematopoietic system, and that there may or may not be an outpouring of excess white blood corpuscles into the peripheral blood . This case alerts dentists to maintain a high-index of suspicion of systemic diseases when unexplained mucocutaneous manifestations are seen. In our case, multiple complicating factors-treatments for typhoid and the leukopenic blood picture did not lend to a primary diagnosis of leukemia-based solely on gingival enlargement. In view of overwhelming and ominous clinical signs and symptoms of inflammatory gingival enlargement with persistent bleeding; the clinician should carry out all the essential investigations to rule out hematological abnormality. The crux of clinical excellence lies not in keen observation alone, but the perspicacity to envision the investigations necessary to substantiate a diagnosis. 1. Benez A, Metzger S, Metzler G, Fierlbeck G. Aleukemic leukemia cutis presenting as benign-appearing exanthema. Acta Derm Venereol 2001;81(1):45-7. 2. Rubnitz JE, Gibson B, Smith FO. Acute myeloid leukemia. Hematol Oncol Clin North Am 2010;24(1):35-63. 3. Demirer S, Ozdemir H, Sencan M, Marakoglu I. Gingival hyperplasia as an early diagnostic oral manifestation in acute monocytic leukemia: a case report. Eur J Dent 2007;1(2):111-4. 4. Cooper CL, Loewen R, Shore T. Gingival hyperplasia complicating acute myelomonocytic leukemia. J Can Dent Assoc 2000;66(2):78-9. 5. Bressman E, Decter JA, Chasens AI, Sackler RS. Acute myeloblastic leukemia with oral manifestations. Report of a case. Oral Surg Oral Med Oral Pathol 1982;54(4):401-3. 6. Dreizen S, McCredie KB, Keating MJ, Luna MA. Malignant gingival and skin "infiltrates" in adult leukemia. Oral Surg Oral Med Oral Pathol 1983;55(6):572-9. 7. Anil S, Smaranayake LP, Nair RG, Beena VT. Gingival enlargement as a diagnostic indicator in leukaemia. Case report. Aust Dent J 1996;41(4):235-7. 8. Hou GL, Tsai CC. Primary gingival enlargement as a diagnostic indicator in acute myelomonocytic leukemia. A case report. J Periodontol 1988;59(12):852-5. 9. Dutta TK, Badhe BA. Ciprofloxacin-induced bone marrow depression. Postgrad Med J 1999;75(887):571-3. 10. Mettier SR, Purviance K. Aleukemic myelosis (aleukemic leukemia): with special reference to the clinical significance of the myeloblast-analysis of twenty cases. Cal West Med 1938;49(4):296-300.